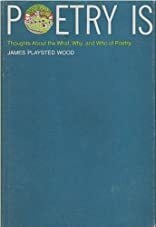 Poetry is; thoughts about the what, why, and who of poetry. 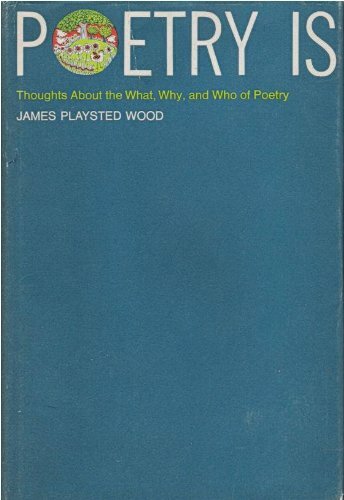 James Playsted Wood writes in his introduction: "There is one convenient thing about poetry. You cannot be wrong about what you say about it, for the simple reason that you cannot be right." Having made his disclaimer, the author proceeds to say a good deal about poetry and he says it in a highly readable, entertaining way. He covers a wide field of poetry in English, a variety of types of poetry and styles. He discusses individual poets as both products and mirrors of their time and quotes generously from their works. He ranges over nursery rhymes, narrative poems, Shakespeare and T. S. Eliot; he speaks of rhythm, meter, form and subject-from Herrick's "Julia" to "archy and mehitable." POETRY IS is a personal as poetry itself. Although this visit with the muse is necessarily a brief one, the cohost is genial and his enthusiasm is infectious. The reader may agree or disagree, but he's likely to have a good time of it, either way.